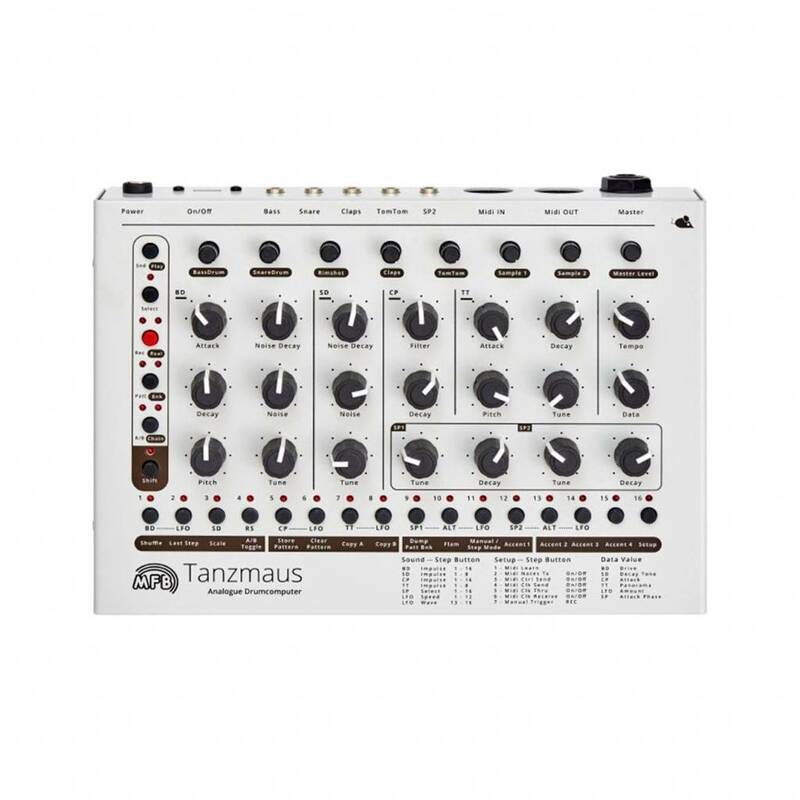 The Tanzmaus drumcomputer is a further development of our MFB 503. He offers five analogue percussion instruments and two sample sections, who have access to 16 samples. 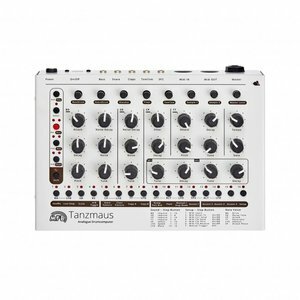 The Tanzmaus drumcomputer is a further development of our MFB 503. He offers five analogue percussion instruments and two sample sections, who have access to 16 samples. Furthermore you can program an alternative sample. A chase sequencer stores up to 64 patterns. You can chain up to 16 different patterns, A/B let you switch or alternate between A and B. Moreover you can program up to 16 different Flam algorithm. Step lenght is individual selectable for each instrument - polyrhythms are easy to get. 32 steps, 16th or 16th/8th triplets are the basic metrics and a 15 different shuffles can be set globally. Four different accents are available. Five independed LFOs can be used to modulate the pitch of Bassdrum, Claps, Tom, Sample 1 and Sample 2. 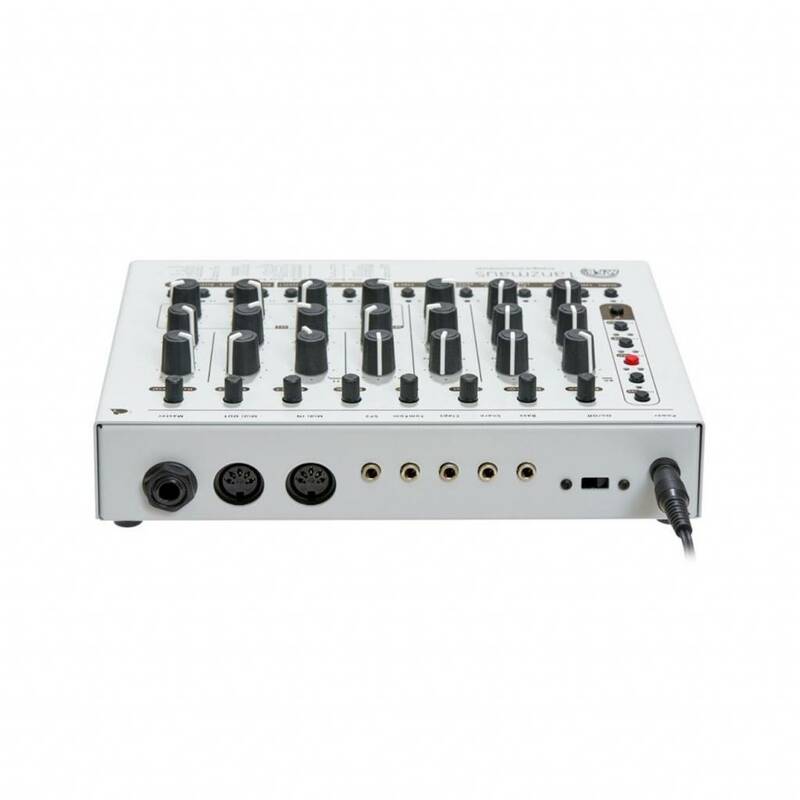 They offers four waveforms and can be programmed independly for each step. 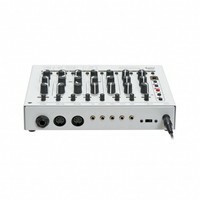 All Soundparameter can be recorded in step- or realtime mode. The sequencer sends Midi notes and can trigger other soundsources. 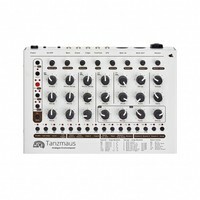 Tanzmaus send and get Midi Clock. Beside Master Volume each instrument has its own volume pot and mute function. You have five individual outs and one stereo out, Claps are in stereo. The compact chassis is built from steel plate. We offer an selection of alternative samples at www.rides-in-the-storm.de. A sample tool (WIN/OSX) allows to use your own samples (OS 1.6 is needed).